Big Sandy Pond, like almost every pond is Plymouth, is almost completely weedless and has a high water visibility. 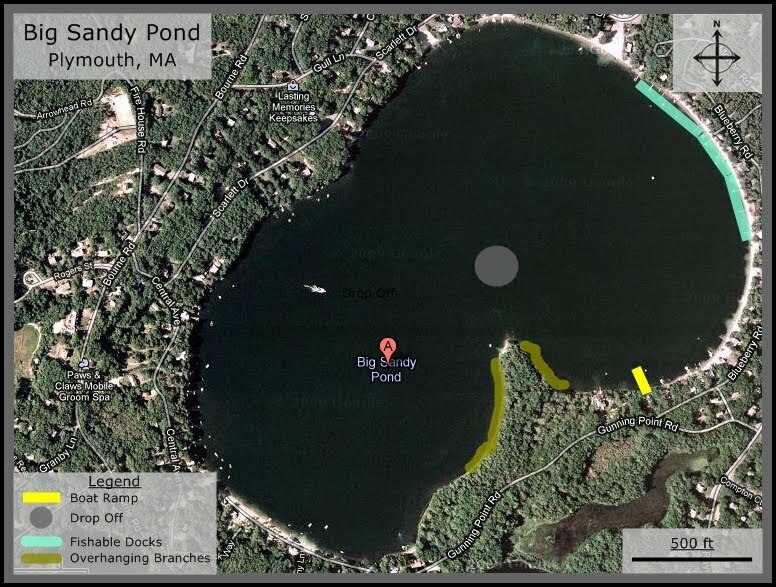 Also, it is much deeper than most other ponds in Massachusetts. That being said, it must be fished much differently than your average northeastern pond which is usually riddled with weeds and lilly pads. Like a few of the other ponds I've written about, unless you own land on the shore, you can only fish it if you drop a boat in. There is a boat ramp with plenty of parking located on the eastern shore. Last I heard, Gunning Point Rd has been blocked off but the ramp is still accessible. I'm looking for more info on the best route to get there. I believe you should be looking for Blueberry Road. For the most part, I fished three distinct aspects of this pond with some success. There are plenty of docks running into the water on Big Sandy which are always a good place to start when you can't find any structure in the water. They are especially abundant on the eastern shore. I worked both a BICO jig and a spinner around them with some success. After that, we fished some of the shores that had tree branches hanging out over the water, providing some shade for the fish. These can be found on either side of the point that is extending out from the southern shore. Again I worked a worm and a spinner bait over there, catching both largemouth and smallmouth bass. The last spot we fished, which was very difficult to find even with our depth finder, is a severe drop off located just a little northeast of that point coming out from the south. I will mark it on the map for you. It drops from about 15 ft to around 35 ft in some places and finding a drop is always a good spot to fish as they will congregate on around quick change in depth. I caught a few running a deep diving crank bait across the drop off, keeping it in the strike zone for as long as possible. went too drop boat in, there was a closed gate why?